we trekked out to the cute town of Fort Langley a couple of Mondays ago and just when we go there, Myelle took a crap lol. And because I'm her mama, I know there's no way she'd let us put her in her stroller after we've given her relief by lifting her out of the car seat. It was a nice day so we put the "trunk" space of the Yaris to work and changed her there. Anyone changed their babes in nontypical places? LOL! oh yeah! I changed the diaper of our youngest in the back of the car many times...... workes really well lol! Use the back of my blazer all the time! My babe loves to poop right when she's all buckled in and ready to go! 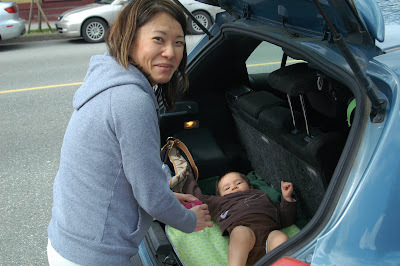 If there is a safe flat surface then it becomes an instant changing table!